The 29th August 2018 marked exactly 100 years since the passing of North Steyne member and Olympian Cecil Patrick Healy. Second-Lieutenant Cecil Healy died bravely leading a group of men in a charge on a machine gun emplacement at Mount St Quentin in France shortly before the end of the First World War. Healy lived his life as an inspiration to others, a man of many talents. He is most remembered for winning a gold and silver medal at the 1912 Stockholm Olympic Games. 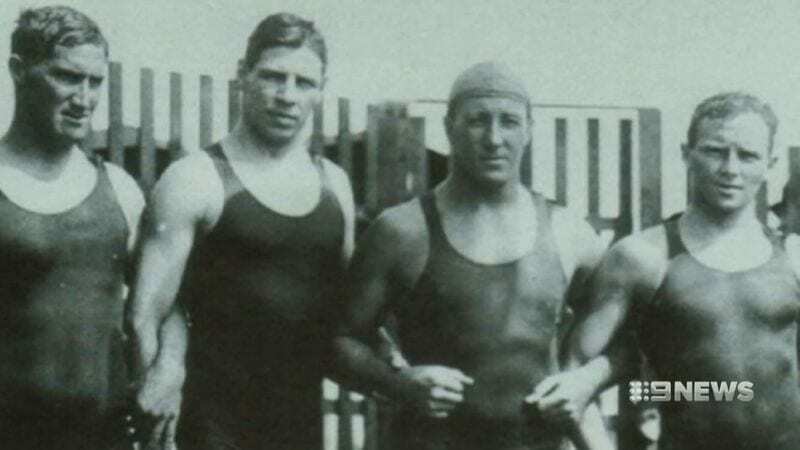 Healy was at the forefront of the swimming and lifesaving renaissance. He held the 100 yard championship of Australasia for 6 years from 1905. If he didn’t reinvent the Australian crawl, he certainly perfected it. Demonstrating the stroke throughout Europe after the Olympic Games, he also published a much reprinted pamphlet it. Healy was generous with his time in always being happy to act as a mentor for those less talented. Lifesaving was established during this period and Healy played his part firstly at the old Manly Surf Club and then at North Steyne Surf Bathers and Lifesaving Club. His swimming skills were put to good use, both in competition for the North Steyne Club and in saving lives. Both Healy and Manly council lifeguard, Jack Reynolds, made a very difficult rescue in the summer of 1911 of 2 men who had been swept out off Manly in a big sea. His bravery was praised as the most meritorious rescue and resuscitation during that swimming season in letters written by eyewitnesses to The Telegraph newspaper. Cecil Healy was awarded the Silver Medal for Bravery and Certificate of Merit from the Royal Shipwreck Relief and Humane Society of NSW. Perhaps Healy performed one of the greatest feats of sportsmanship when he insisted that the Hawaiian swimmer, Duke Pao Kahanamoku be allowed to complete his qualification for the 100 yards final at the 1912 Stockholm Olympics. It was also at Healy’s behest, in writing his column for the newspaper The Referee, that the NSW swimming Association brought Duke Kahanamoku to Australia to promote the sport of swimming. North Steyne club members the Walker brothers helped Duke shape surfboards for riding displays while he visited. “Lest we forget – The Fighting of World War I? For Diggers, there was none more brutal in Australian history. And I don’t mean Gallipoli. I mean France. I mean the Western Front, starting with the battle of Fromelles and Pozieres and going all the way through to Armistice: Mud. Blood. Swarming Germans, with machine guns that could spit 600 bullets a minute. The battle of Mont St Quentin was on 29 August 1918, and it saw the Australians attacking across open fields against entrenched German positions. One of the men leading the charge was Australia’s Olympic gold medalist Cecil Healy, who was one of the victorious 4×200 metre relay swimmers at the 1912 Stockholm Olympics. However, Healy was far more celebrated for what happened in the 100-metre individual sprint. When the favourite for the event, the Hawaiian, Duke Kahanamoku, was disqualified for missing the 100-metre semis because he had got the start time wrong through no fault of his own, our man Healy became the new favourite. Nevertheless, the Australian refused to race unless Kahanamoku was given another chance. The end result: the Hawaiian got gold, Healy silver. Kahanamoku found him after the race, lifted his arm and said “this is the real Olympic champion”. It was the beginning of a strong friendship. Two years later, Duke Kahanamoku came to Sydney gave a lesson in surfing at Freshwater Beach, and the world changed! Cecil Healy joined the AIF shortly after the war started, and could easily have taken all the glory without any of the risk. But he didn’t want that. He wanted not only to do his duty, but to lead men in battle. And command them he did, as a Second Lieutenant with the mighty 19th Battalion. On the early morning of 29 August 1918, Cecil was moving C Platoon across open ground in the Battle of Mont St Quentin when a German machine-gun opened up on them, hitting him in the neck with a single bullet. It took him an hour to die. A colleague would later say that “his fearlessness supplied the enemy with too good a target to miss.” Healy was 36. He remains the only Australian Olympic gold medalist to die at war. Cecil’s remarkable life and death is being commemorated in Australia by a major biography, Cecil Healy, Australia’s Forgotten Hero, co-authored by 1960 Olympic gold medalist John Devitt, together with the accomplished author, Larry Writer. Devitt will be there in France in a fortnight when Cecil’s memory will be honoured at the British military cemetery at Assevilliers, where he is buried. A group of Cecil Healy’s relatives recently visited France to mark 100 years after his death. A film clip of their journey can be seen here. At the end, a North Steyne cap can be seen on his gravestone.